AfriKids have known Talli for most of her life. 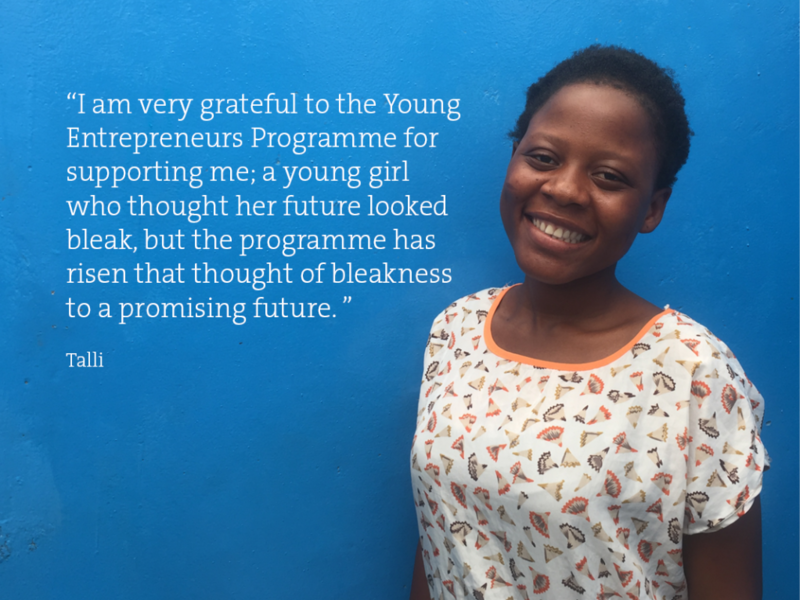 Having grown up in the care of Mama Laadi at AfriKids’ Operation Mango Tree home, she was enrolled on our Young Entrepreneurs Programme (YEP) when she was in her early teens. For children transitioning from care to more independent adult life, their teenage years can be a difficult time and it can be hard to adjust, which is why the support of Lena, who heads up the programme, is so important to young people like Talli. ‘It is an honour for me to be part of the Young Entrepreneurs Programme of AfriKids and since then my life has not been the same. I stayed in Mama Laadi’s home in all my growing stages of life until I joined YEP as a young promising girl. With the help of the programme, I was able to complete my senior high school without much difficulty of how to pay my school fees, transportation and food. Life with YEP really supported me in my senior high school days and up until now, because I do not need to come from school and take on menial jobs to earn money for my school fees. My life really has been impacted because I have a room which I can call a home. There is no fear of where I will sleep, what I will eat and more importantly my education. This year, Talli began studying Geomatic Engineering at Ghana’s University of Science and Technology!